Research on religions in Japan has focused mainly on Shintoism, Buddhism and Christianity with other minor religions defined under the broad category of folk religion. As current research has not adequately addressed the issue of minor religions in Japan, my interests lie in examining how these minor religions construct their identity against mainstream ideas of religion in contemporary society. I focused on Onmyōdō and examined how this little studied Japanese system of beliefs presents itself in modern-day Japan. Onmyōdō is a religious belief that was particularly influential during the Heian period. It derived from the Taoism of China and employs the use of the Theory of the Five Elements. This system of beliefs requires a strict observance of certain rites and taboos, and revolves around the use of astrology, augury, astronomy and incantations to foretell disasters and counter misfortune. The rising popularity of Onmyōdō since early 1990s in Japanese popular culture such as literary books, movies, dramas, video and internet games, manga, and anime, has created a new interest in this enigmatic practice, an interest that has spread to oversea countries of China, Taiwan, Hong Kong and Singapore and resulted in a series of Japanese scholarly publications, documentaries and exhibitions held in Kyoto and Osaka. 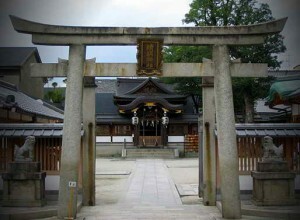 The Seimei Shrine which practices Onmyōdō set up a website in tune with the boom of the religion in popular culture. I combined a close analysis of the Seimei Shrine website with my own ethnographic experiences to analyze how the shrine constructed its religious identity as it attempted to differentiate Onmyōdō from prevalent imaginations of this religion in popular culture. From the website, I identified several strategic measures employed by Seimei Shrine in its identity construction. The shrine reconstructed its image as a modern religion that is relevant in contemporary society and engaged in domestic and foreign cultural exchange while taking care to distant itself from magical elements that are commonly associated with Onmyōdō. It also appealed to traditions by emphasizing its strong links to the Japanese imperial family and downplaying the foreign origins of its religion. The Seimei Shrine’s construction of itself as polytheistic and sharing Shinto roots followed mainstream Japanese conception of religion. However, the attempts to fit into contemporary society and integrate into Shintoism raises the question of Onmyōdō losing its distinctive nature and risking the possibility of being further subsumed under the dominant religions. The Seimei Shrine’s attempts at identity construction provide an illuminating insight into the minor religions’ efforts to re-assert themselves in modern Japan. This entry was posted in Social and tagged Japan, Onmyōdō, religion, Seimei, Shrine on 24/02/2018 by Mary.